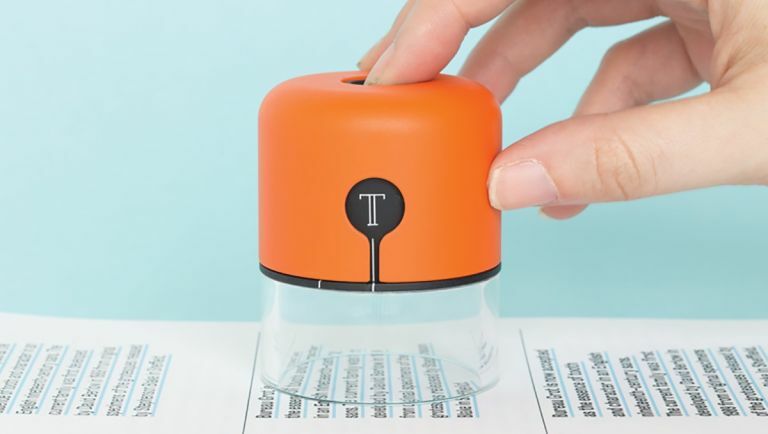 ARoyal College of Art MA student has built a pocket-friendly device called the Spector, which captures both typography and font hues by scanning them with a tiny camera - these can then be directly uploaded and used in programs such as InDesign. Its creator, Fiona O'Leary, designed the Spector following her frustrations with being unable to fully recreate the fonts, hues or textures she saw when out and about in search of creative inspiration. Designers will often take photos of a particular example, but O'Leary want something that captured the muse itself. "It is a handheld device allowing various print materials to become interactive," she explained in an interview with Engadget. "If designing for print, it is best to start with print." The device essentially captures a sample of a given font and applies an algorithm that assignsCMYK and RGB values. These are then used to rebuild said font or colour in design program InDesign. "Designing for print on screen is tricky and always requires clarity," adds O'Leary on her official site for Spector. "There is very little sense of the scale of typography and colours often look different. This results in multiple printouts to test the different font sizes and colours. Spector is a tool that helps bridge the divide of designing on digital screen and the finalised print. It is a hand-held device allowing various print materials to become interactive. If designing for print, it is best to start with print." O'Leary says the Spector is only in prototype form, and while she's proved the device and concept really works, she's stated she's in no hurry to get it into commercial release just yet. Sorry designers, best break out that camera just to be safe.